MV Mantaray provides the ultimate platform for passengers to experience the Whitsundays and underwater world of the Great Barrier Reef. You can choose scuba diving, as a first-timer or certified diver, or snorkelling, and you are guaranteed to make memories to last a lifetime. When you are not underwater, you will be amazed by the visits to all the hot spots including Hill Inlet Lookout, Whitehaven Beach and Whitsunday Island! 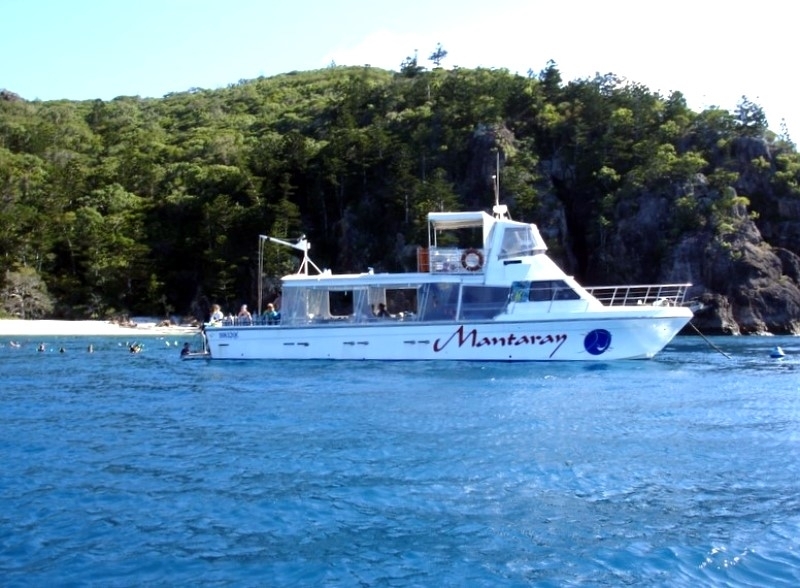 Experience the magic of the Whitsundays, above and below sea level with MV Mantaray! Sometimes photographs don't do a place justice and Whitehaven Beach is certainly one of these! You will see the amazing silica sands on the beach and you can also enjoy a guided nature bushwalk through the Whitsunday Island National Park on Hill Inlet's scenic lookout. Bring your camera! You will visit some of the best snorkelling and diving locations which the Whitsunday Islands have to offer under the guidance of your experienced crew. Scuba Diving: It is an additional cost. Please note dives are subject to weather, other conditions and the dive instructors discretion. Certified dives should be pre-booked at time of booking and divers must be certified with PADI and must have card with them on the day. Intro (non certified) dives are booked and paid for on board the boat but you must advise us at time of booking please. Dives are subject to conditions. Your safety in the water is our primary concern. To ensure your comfort and safety divers must be 18 years or over and they may require that you have a Divers Medical Certificate for certain medical conditions. All departures and itineraries are subject to weather and may be changed or cancelled at the discretion of the boat company. It should be noted that adventure travel involves risk. Whilst we make every effort to safeguard clients, we cannot be responsible for personal injury or loss due to actions of our clients which are beyond our control. We recommend that all clients have travel insurance covering illness, injury, loss or damage to personal belongings or not being able to travel on the confirmed date of departure. Please be aware operators pass on credit card merchant fees so there is a non refundable 2.5% surcharge for VISA and MASTERCARD card purchases.